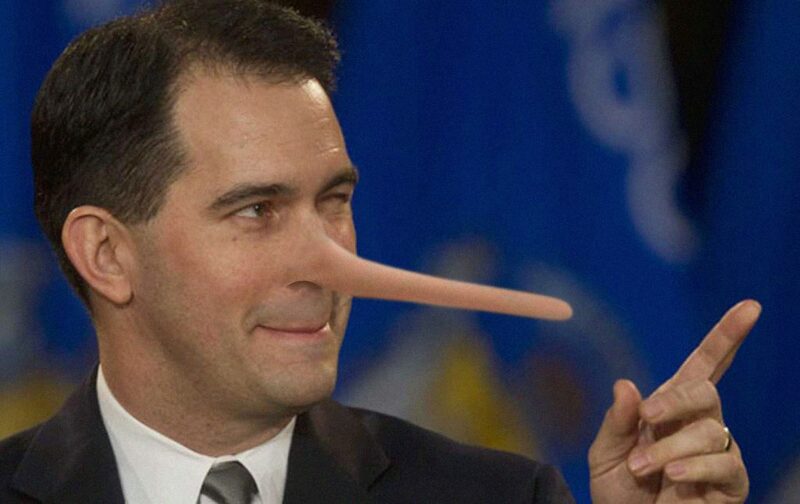 Scott Walker as Pinocchio. Photo illustration by Tom Bamberger. Since December, Gov. Scott Walker has been telling a lie about why he wouldn’t hold special elections. The governor refused to call special elections after two Republican lawmakers, Sen. Frank Lasee of De Pere and Rep. Keith Ripp of Lodi, announced they were taking jobs in the Walker administration on December 29 of last year. Walker said he was doing this to save the taxpayers money. To hold special elections would be “an unnecessary waste of taxpayer resources,” he has repeatedly insisted since then. In fact, the governor had plenty of time to call the special elections and add them to the normal February primary and April general elections — in fact this was more time than he allotted when calling a special election after then Republican state Sen. Sheila Harsdorf joined his administration. And what would a special election in the normal spring election cycle have cost taxpayers? Zero. There would be “no additional cost,” says Reid Magney, public information officer for the Wisconsin Elections Commission. And by February or next week Tuesday at the latest, these districts would have had new representatives. With no cost to taxpayers. Instead, Walker has repeatedly refused to hold special elections, only giving in yesterday, after three different courts ruled he was violating the state law requiring elections. So what will this cost us? The last election held in the now vacant 1st Senate District cost taxpayers $234,876 in the Spring 2017 election, while the cost of that election for the now-vacant 42nd Assembly District was $71,730, according to the Elections Commission. That’s a combined cost of more than $306,000. Magney, however, notes the cost for a special election won’t be as high because the turnout will be lower. So perhaps the cost will be in the neighborhood of $200,000. But that’s not all, because Walker was sued by former U.S. Attorney General Eric Holder and the National Redistricting Foundation for refusing to hold special elections. And rather than accepting the inevitable and agreeing to hold the elections, Walker instead had a team of lawyers defend the state. Those lawyers had to represent the state in a case before Dane County Circuit Court Judge Josann Reynolds, followed by an an appeal before Dane County Circuit Court Judge Richard Niess, followed by an appeal to District 2 Court of Appeals Judge Paul Reilly in Waukesha, who left in place the lower court decision that special elections must be held. What did all this lawyering cost the taxpayers? I contacted the office of both Gov. Walker and Wisconsin Attorney General Brad Schimel, who assigned Assistant Attorney General Steven Kilpatrick to defend the governor, and neither office would reveal how many lawyers worked on this case or what the cost to taxpayer was. Nor is that the end of the costs. For Walker had urged the legislature to hold a special session to change the law, which means taxpayers would have had to pay “per diem” costs of $184 per day to any legislator outside Dane County for each day spent in Madison to pass a law preventing people from having duly elected representatives. Just one day of legislating would have cost in the neighborhood of $18,000. Walker, it seems, was willing to charge the taxpayers whatever it took to prevent elections from being held. Why? Because the Democrats have been outperforming Republicans across the country in special elections. A January special election for an open seat in Wisconsin saw Democrat Patty Schachtner win in a heavily Republican district by increasing the Democratic percentage by 18 points over the previous election. To protect himself and his party from this, Walker wasn’t just willing to charge taxpayers all these unnecessary costs. He was willing to disenfranchise the 175,000 citizens living in these two vacant districts for more than a year, from December 29 of last year until January 7, 2019, when the new legislators elected in November 2018 will be seated. And these, by the way, are both Republican-leaning districts. Voters in these districts have thus lost any say over all state government decisions made over this entire period, as Walker and the legislature have debated a host of issues, from gun control to a sales tax holiday, from health care reinsurance to closing Lincoln Hills school for boys to tax breaks for the Kimberly-Clark company. But most egregiously, these citizens would have had no representation if the legislature, as urged by Walker, had passed a new law preventing these districts from electing new representatives in a timely fashion. “They have no say in that bill at all,” Judge Niess marveled in his decision rejecting Walker’s appeal. The obvious lies by Walker call to mind Pinocchio, of course, but there is far worse comparison to be made in capturing the depths to which Walker and the Republicans have sunk. Walker’s partisan scheming meant the citizens of these two districts would pay at least a year’s worth of state sales taxes, income taxes and other state fees but would have no political representation. As every American who took grade school history knows, this is taxation without representation. And “taxation without representation is tyranny,” as the colonial leader James Otis declared. We could argue whether the democratic infringement of Wisconsin’s citizenry by Gov. Walker is as bad as that imposed by the imperious King George III. Perhaps not. Though it’s worth noting the colonists had local governments that made many decisions, and merely needed to suffer the occasional imposition of a stamp tax or a tax on tea by their distant colonial overlord. Whereas the residents of these two Wisconsin districts were losing all say over all state government decisions made over a one-year period. But the idea the such a comparison could even be broached speaks volumes about how virulently partisan a governor we now have, and how tone-deaf a long-savvy politician has become in his desperation to win another term of office. Taxation without representation, another Republican principle I didn’t know about. Exactly! Excellent reporting Mr. Murphy! Career Politician Scott Walker and republicans hate democracy They hate freedom and they absolutely loathe every Wisconsinite’s right to vote. On top of all that they lie, cheat and steal every single day. I am so thankful for the wisdom of these judges and for the National Redistricting Foundation for standing up for our constitutionally protected right to vote and for standing up to these corrupt republican charlatan’s attempts to ignore, subvert or do an end around the LAW! Not gonna gappen anymore Walker. Not going to hapoen republicans. Bruce two thoughts – one, every pothole one hits is a symbol of Walker’s ambition and his unwillingness to recognize the reality of a transportation system which badly, BADLY needs fixing. His unwillingness to break away from Grover Norquist and the notion that government is evil can be felt as your body challenges your seat belt and you risk losing control. And what is especially missing is his care for his core constituencies in the rural counties where the real challenge is the non-interstate roads and railroads depended upon by small towns and farming areas. Second, part of his argument is based on the notion that because there was no legislative session scheduled these districts didn’t need representation. Thus, senators and representatives get paid to vote. OK, let’s change the pay scale and pay only when the legislator is in session and not offer salaries to these folks when they are not! Thanks as always for your insight and coverage. AND Happy Easter!! Watch for the bemused and condescending response. Utter ignorance of factual data. Laughable, if not so totally humiliating. @revtlee, Career Politician Walker and republicans have run up a one Billion dollar and counting (due to their inability to simply calculate for inflation) DOT budget deficit all while handing over 4.5 billion and counting in our tax dollars to a foreign company thus there simply is no money for roads. People in rural Wisconsin don’t even have high speed internet because Walker rejected it. Thankfully if you live close enough to the border you can move your business to Minnesota as I have so as to have high speed internet needed for business, a functioning affordable healthcare system, lower taxes and roads and infrastructure that are not crumbling like in Walker’s Wississippi. I’m patiently waiting for one of the usual suspects to defend dear leader in a succinct, intelligent, and truthful manner. WashCoRepub already has. Elsewhere he said Dems are wasting taxpayer money and helping to drive up Republican turnout. WashRethug has only 2 principles. -Not a very good stance for Walker with an upcoming re-election. -Denying state residents legislative representation because : Might be confusing ; would cost too much ; little time left in the legislative schedule etc . -How is this ” What’s best for the residents of Wisconsin ” ? Question. What happens when Career Politician Scott Walker and the entire Wisconsin republican corruption cartel runs head long into Eric Holder? Holder slam dunks on them and humiliates them. NOT holding an election costs a lot less than HOLDING an election. SO, on its face, regardless of how much elections usually cost, Walker was right – he would have saved money by NOT calling an election – were it not for the liberal lawsuits by Democrat forces who would like a shot at the value of incumbency – however brief – going into the regular election. I must side with Walker on this one. If not for the nuisance suits seeking partisan advantage, Walker’s decision NOT to call special elections would have saved money. And most voting age persons would not even notice that they were unrepresented as most could not tell you the names of their legislators anyway. Chase Walker around the cobbler’s bench all you want, it’s very entertaining and he asks for it, but I’m on his side this time. He has the math. HOlding an election costs money, NOT holding an election doesn’t. The lawsuit is one more thing to blame Dems for in the next election. T.J. : I don’t think the state constitution allows the governor not to call the representative election due to its expense. -Walker could have called it in January—but did not. -Waiting until March to challenge it with Schimel’s lawyers is costing the hardworking taxpayers money. -It makes Walker look even more petty & partisan and fearful of the election result. That is a pathetically weak defense for Walker not calling special elections due to his fear of losing those seats. Sorry folks special elections cost money so no representatives for you. I’m so worried about the cost. Not that Republicans might lose. Right. Walker foolishly costing taxpayers money on elections is only the very tip of a huge iceberg. When it comes to the basics, infrastrucure, economic development, education, health and human services, justice and corrections, tax policy Walker has consistently and recklessly tossed taxpayer dollars around on efforts to placate a cult like following, think WMC, (and desperately trying to improved his rating), while ignoring long term stability and fiscal responsibility. It’ll take a decade for Bucky Badger to clean up the mess Walker has made. “And what would a special election in the normal spring election cycle have cost taxpayers? Zero. There would be “no additional cost,” says Reid Magney, public information officer for the Wisconsin Elections Commission”. The state of Wisconsin is full of corruption and it’s getting worse every day. Dictator’s from the past and present are blushing with the way Wisconsin went from a clean open government to a ruling type government. Oh. Well in that case, let’s just never have any elections ever again. It’s cheaper, which is apparently the only consideration to retards like you. I’d say this was by far the best analysis and reporting on the special elections fiasco created by Walker. Walker is an incompetent and immoral Governor. He needs to go. Let’s hope the Dems put up someone strong. I like Flynn and Wachs. Both would know how to play hardball with Walker. I guess holding an election costs a lot less than making a big stink about it and then holding an election because you have to – like really, that was your game, to not hold an election?